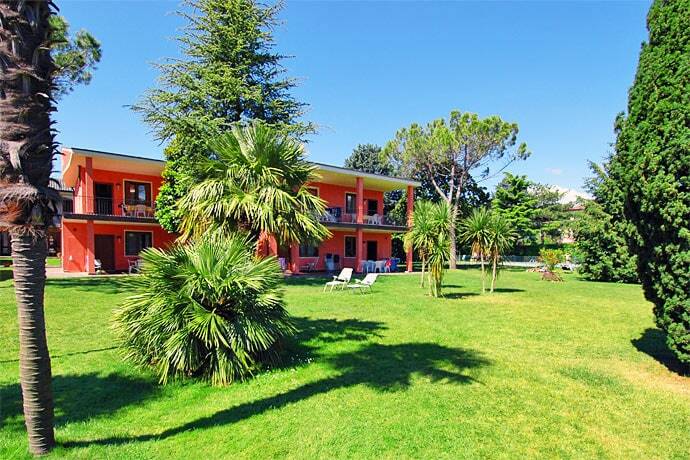 Welcome to Apartments Oasi Manerba del Garda. Residence Oasi is situated in the Pieve di Manerba del Garda Gulf, only 50 m. from a marvellous beach that extends for 8 km. Immersed in 9000 sq.m. of greenery, among parkland and olive groves, there 28 fully-furnished apartments with 1,2, or 3 bedrooms, heating, ample terraces, and private parking. Guests can enjoy the swimming pool, ping pong, children's playground, barbecues, use of buoys for their boats. Nearby there are facilities for tennis, scuba diving and other water sports, or for rental of scooters, motorboats, and sailing boats. Manerba del Garda, embraced by the Valtenesi hills, offers magnificent trails through the greenery for walks, horse-riding and mountain bike rides. We shall be happy to give you all the information concerning the itineraries of varying difficulty and the rental of bikes. Also worth a visit are the Caneva World and Gardaland fun parks, the Parco Natura Viva, or exclusive places such as Garda Golf (only 2 km. away), the Sigurtà Garden Park, the Verona Arena … or the thermal pool in Colà di Lazise for some relaxation. (Residence Oasi Manerba del Garda apartments residence).